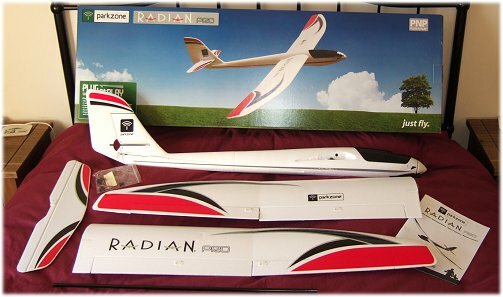 The five channel ParkZone Radian Pro is a nicely upgraded version of the original three channel Radian electric powered rc glider and is aimed at intermediate and experienced glider pilots rather than the complete beginner, for which the original Radian is of course perfectly suited. 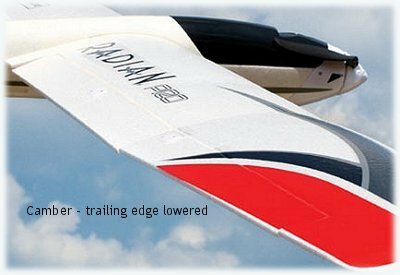 The big difference with the Radian Pro over its simpler cousin is the number of channels and the wing-based features; with a 5+ channel transmitter with mixing functions you can adjust the airfoil of the wing in terms of reflex and camber, and also enable crow braking. By giving both flaps and ailerons a slightly upward (negative) angle you are creating a reflexed airfoil, this increases the speed of the glider through the air but marginally reduces lift - good for, say, faster slope soaring. By giving flaps and ailerons a downward (positive) angle you are increasing the camber and this will result in slightly more lift, but also a bit more drag - good for thermalling, for example. With both reflex and camber changes, the trailing edge only needs to move a very slight amount to make a noticeable difference - 5mm up and down is plenty. Crow braking is the term given to a function whereby both flaps deflect downwards to increase drag and both ailerons go upwards to act as spoilers and reduce lift; crow brakes, also known as 'butterfly', are very effective for getting fast rc gliders back on the ground quickly! Above: the reflex, camber and crow brake features of the ParkZone Radian Pro. You can see that crow braking makes a big difference to the length of a landing. I also use crow braking on my non-powered gliders, where possible. The reflex and camber settings on the Radian Pro also make a difference to the in-flight performance; the camber is particularly noticeable when thermalling. For power, the Radian Pro uses the 480 size brushless outrunner with folding prop, and a 3S 1300mAH li-po battery pack is recommended. A 30A brushless ESC completes the powertrain setup. 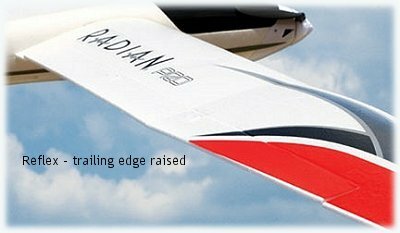 Given the low wing loading of such a powered glider like this, the Radian Pro has ample power with those components and flight times can be potentially very long with economic use of the motor. Having said that, the climb rate with the stock prop blades is very poor, but you can read about that mod further down the page. 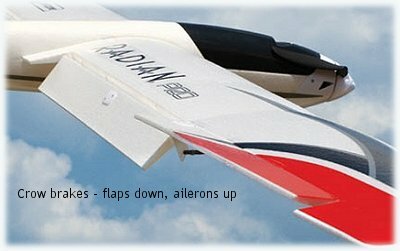 There's no RTF version available with the Radian Pro - as with other ParkZone aircraft recently released, only a BNF™ (Bind-N-Fly™) version and PNP™ (Plug-N-Play™) are available, the BNF one has a Spektrum AR600 receiver installed. Overall Length: 45.0 in (1140mm). Motor Size: 480 Outrunner Brushless Motor 960kV. Prop Size: 9.75 x 7.5 Inch Folding Prop. Speed Control : E-Flite 30Amp Pro Switch-Mode Brushless ESC. In true ParkZone fashion, the glider comes in a very sturdy box so transit damage is highly unlikely. And being a BNF or PNP rc plane, the Radian is sold in the usual ready to fly-based form. There's very little to do to get it ready for flight. Above: the ParkZone Radian Pro unpacked. Probably the biggest thing to do is to program your radio to get the wing control surfaces functioning correctly. The ease of this is going to depend on which radio you have; I personally have a JR DSX9 and setting the glider up was a complete breeze. Crow braking on my Radian Pro is activated with the throttle stick (a common configuration for gliders with crow brakes) and motor power is on the right hand side slider, and it all works very nicely! From a personal point of view, I've been very impressed with my Radian Pro. I belong to an rc soaring club and have entered my RP in our club competitions, and I'm happy to report that it has, on occasion, outperformed much more expensive electric gliders. My club flying has proven that it's well worth taking the time to set up the wing to benefit from the reflex, camber and crow - the latter is especially handy for those spot-landing competitions. The Radian Pro really is a good rc powered glider for the money, and I can give it a big thumbs up. Change the prop blades. This mod is a must! The climb rate of the Radian Pro with the stock blades (9.75" x 7.5") is very poor. After a recommendation made in my forum, I changed to Graupner 11"x6" blades and the difference is huge. The stock ESC can still handle the slightly higher current draw demanded by the larger blades. Change the flap and aileron servo connectors to the green Multiplex type. One of the worst things about the RP is how fiddly it is to connect all the wing servos to the receiver, regardless of whether or not you use extension leads. By changing to the Multiplex connectors, this job is made sooo much easier. Insert 10mm internal diameter (ID) carbon tubing into the wings, inside the stock holes. With time, the holes in each wing panel, that the joiner slots into, gets slightly larger as the foam compresses around the joiner. If you glue some 10mm ID carbon tube into those holes, that the joiner can slide into, the whole wing joining method becomes much more solid. Much better than having the joiner just slide into the foam. I also used smaller diameter carbon tube and rod to make a secondary joiner towards the trailing edge of the wing. This has also helped stiffen things up a lot. Those three mods have really improved my Radian Pro, but if you're only going to do one of them, make it the first one on the list and change those stock prop blades!